I must admit that a few years ago, when I initally saw the Honda Element I probably thought some of the the same things you did… “Square” “Toaster on wheels.” “Ugly as home-made soap” However, once our dealership put the first unit in our used car inventory and I had a chance to check it out; I was pretty impressed…. Not with the sleek, aerodynamic look of a bite-sized Hummer, but instead with the forethought of Honda’s engineers to develop a vehicle that could be so useful. You may remember that one of Honda’s first claims to fame was that the Honda Element interior could be washed out with water. It had truely been developed as a vehicle that could haul stuff…. It also was marketed as a camping vehicle because you could actually get a genuine Honda accessory tent that mounts to the rear hatch and tailgate…. Talk about cool. Now that the Honda Element has got some age on it, prices have come down… The engine has a long running, virtually maintenance-free timing CHAIN instead of the traditional timing BELT, which has greatly reduced the maintenance costs at 100,000 miles. During the past 5 or 6 years, our used car department has sold several Honda Elements, including a 200,000 mile 2003 Honda Element that was traded in to us…. We sold that vehicle to a buyer from Knoxville, within a few days, and with additional buyers waiting in line if he didn’t purchase it. Both Toyota and Nissan have produced a copy-cat version of the Honda Element. While these car manufacturers saw the usefulness of the design, they did not produce their versions with the wide footprint that the Honda Element has. 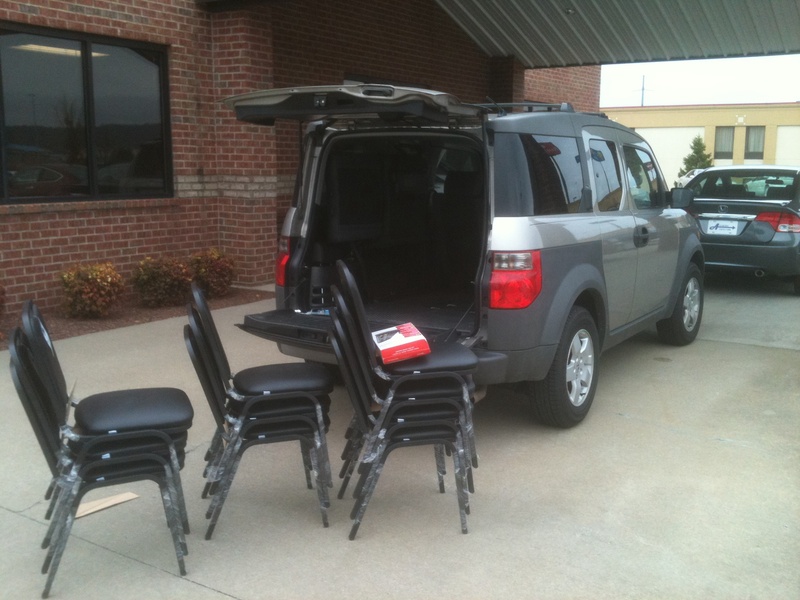 This may seem like a minor complaint, but think about it; the wider footprint of the Honda Element makes it much more stable and less likely to be top heavy, and we all know what top heavy means…..
Today, I had to go pick up some new chairs, for our Service Department’s newest addition to the customer’s lounge at Accurate Automotive…. After-all, our loyal Honda and Acura service customers are professionals and they are also very productive…. They don’t want to sit in a chair and watch the Price Is Right while maintenance is being performed on their Honda or Acura vehicle…. 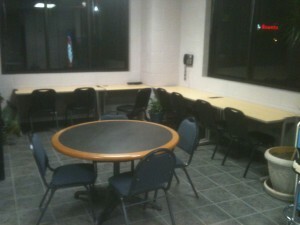 They needed an area to work while they were waiting and as always, we are truely committed in accomodating them. The morning weather was questionable. It was a little warm for Tennessee on December 21st and it looked like rain. 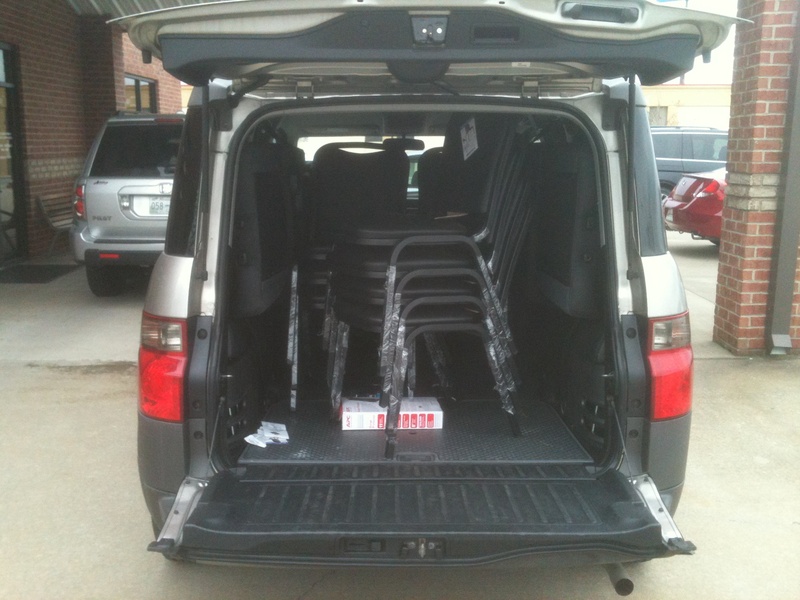 So I took the 2004 Honda Element that is in our current pre-owned / used car inventory and picked up the new chairs…. All 10 of the chairs fit in the Element, in one trip and with room to spare. Check out the photos. 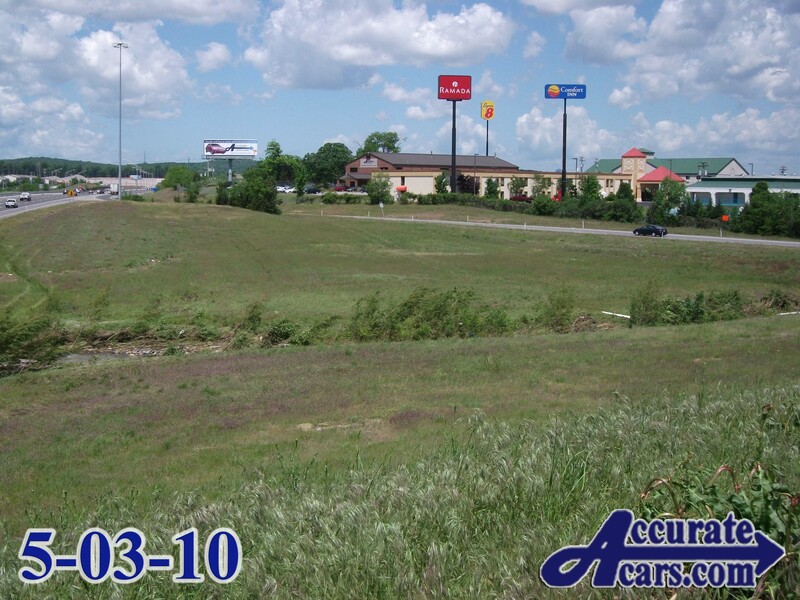 Come in and see why www.accuratecars.com is the best place in Nashville and Middle TN to purchase and service your Honda and Acura automobiles. As the temperatures rise, so do the gasoline prices for Honda Car Owners. Consider the following steps to save money and get every drop of fuel that you are being charged for. It is not likely that we will forget those high fuel prices that effected everyone in the U.S. back in 2008. We wrote a blog on it called Last Year’s High Gas Prices…A Distant Memory or a Preview of More to Come? We have listed three fuel saving tips that we remind our customers about during the summer. These gas saving tips will save you money and we will even tell you why it will save you money. TIP #1 Buy your gas when it’s the coolest. During the summer, things cool off during the night. For this reason, the best time to gas up your vehicle is very early in the morning. Bottom line: Filling-up on a hot afternoon results in paying for a full gallon of liquid gasoline and getting a partial gallon of liquid gasoline and a lot of unusable vapor. Tip #2 Fill up the fuel tank when the gauge shows half a tank of fuel remaining. This is especially important during the highest and hottest temperatures. Here’s the reason for keeping the fuel level between half a tank and full in those summer temperatures. As the liquid fuel level drops in the gas tank of your car, it creates an airspace. As the fuel level drops, the airspace increases between the top of the gas tank and the surface of the liquid fuel level. This creates a place for evaporation to take place. Gasoline evaporates faster than you may think. Incidentally, those big above ground gasoline storage tanks that are owned by the oil companies have an internal flouting ceiling, which prevents an air gap from forming in the top of the fuel tank. This is because the oil companies know that fuel evaporates quickly and that’s money in their pocket that would simply evaporate if an air gap formed inside those massive tanks. Tip #3 The slower it flows, the further you go. Simply put, fill your fuel tank on the slowest speed setting. After reading this article, this should be easy to figure out because it also pertains to fuel that vaporizes and is lost during the filling process. If you set that gas pump on the fastest setting, you create excess fuel vapors, which are created while pumping gas. Remember, this is gas that you are paying for, but losing during a fill-up because of it’s change in forms from a cool liquid to a warmer vapor. At Accurate Automotive, we care about our customers and the Honda and Acura vehicles that they drive and depend on everyday of their lives. In this economy, every penny counts and we are committed to saving our customers money. Whether you live in Nashville, Tennessee or in an area around Middle Tennessee, come in and see why we are the best place in the State of Tennessee to purchase and service your next Honda and Acura vehicle. If you’ve been looking at our website you might have noticed that we have several “higher mileage” vehicles, some with 100,000 miles or more. You might wonder why we have them in our used car inventory. 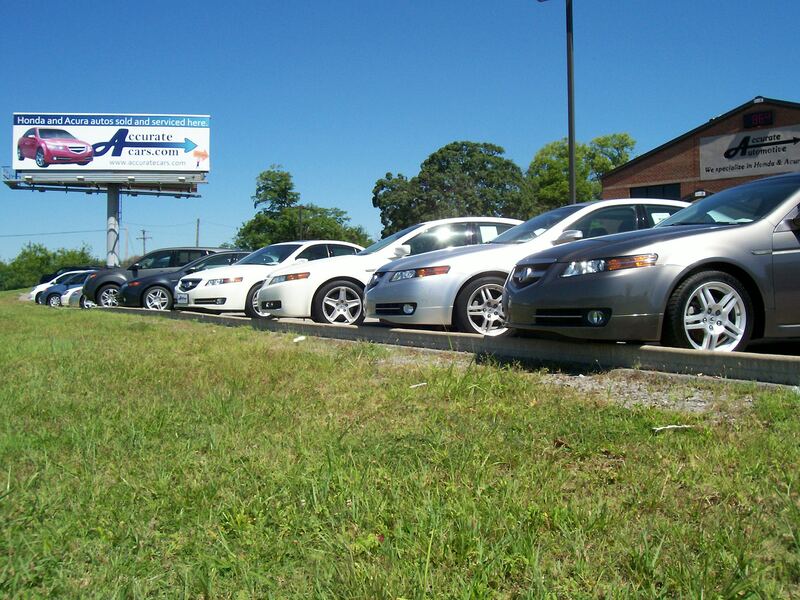 We have them because these Honda’s and Acura’s represent a great value for you! In fact, these might be your best choices if you are looking for a used vehicle. There are several reasons why these higher mileage Hondas and Acuras may represent your best value in a used car. 1). The fact is that good used cars are getting harder to find. 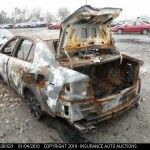 The Government “Cash for Clunkers” program removed a lot of used cars from the road, many of which were not “clunkers” at all (http://accuratecars.com/blog/2009/08/03/is-cash-for-clunkers-a-good-deal-for-car-buyers/). And since they had to be destroyed, they were also removed from the used car market! That means there is a much smaller pool of used vehicles available. Most of the buying attention is, understandably but unjustifiably, on the “low mileage” vehicles. The higher mileage (but equally good and considerably less expensive) vehicles are slipping “under the radar”. Therefore you will have a much bigger pool of quality used cars to choose from! 2). The nature of cars has changed over the last several years. Many years ago 100,000 miles was a lot of miles on a car! In fact, the vehicle was pretty well used up by then. This is not true today. Improvements in oils, metals, plastics make a much more durable vehicle. Improvements in electronics, fuel injection and the use of computers has led to much higher mileage ceilings. You have probably noticed that most manufacturers now offer a much longer warranty than they did in the past. If they didn’t believe their cars would last that long they wouldn’t be able to offer such a guarantee. Today a car that has 100,000 miles on it is barely out from under factory warranty coverage, with lots of quality miles left to go. Many Honda and Acura owners have stories about vehicles that lasted 300,000 miles or more with only proper maintenance! The white 1992 Accord below came in for maintenance. It has over 300,000 miles on it!) If you want to compare eras, 100,000 miles is now what 30,000 miles used to be. Since a lot of people haven’t noticed that simple fact yet, you can get a great deal on a “higher mileage” car that other people would simply miss! 3). You need to remember that mileage is not the most important factor to look at when you go shopping for a car. Age is much more important! We’re all familiar with the legendary “little old lady who only drove this car to church on Sundays”. Think about that car, ok? It may only have 30,000 miles on it, or less (if church was close by!). But it took 10 years to accumulate those miles. 10 summers and 10 winters have dumped their worse weather on that car. 10 years of wear and tear on the exterior and the interior of the vehicle. Plus, those are the “hard” kind of miles. Short distances which don’t give the oil time to properly warm up and circulate. Stop and go, low mileage trips which cause the oil to break down faster than it normally would. And, at the same time, if she changed the oil every 5000 miles then that degraded oil might have stayed in the engine for months! What condition do you think that car is in, even though it only has 30,000 miles on it? Now, consider another vehicle that belonged to a professional who used it as a business vehicle. They may put 100,000 miles on the car in only 2 years! But they are likely to be “easy” miles. Longer trips on the highway for extended periods which gives the oil time to warm up and do its job, which is protecting your engine. Maintenance stops will likely be only weeks apart and will probably be on schedule. When you depend on a car to make your living you tend to take care of it! The interior will also probably be taken care of since first impressions are important in business. Now, you make the call. The 2 year old vehicle with 100,000 miles on it? Or the 10 year old car with “only” 30,000 miles? Admittedly, these are extremes, but I think you see the point. Remember, it’s not “mileage”. It’s “age” that makes a difference! 4). You’re dealing with Accurate Automotive! We are not going to buy a higher mileage car and then just push it out on the lot hoping someone will buy it. Your ‘new’ used Honda or Acura vehicle is going to be fully serviced and professionally detailed, inside and out, before you ever see it! What needs to be replaced will already be replaced when you buy the car. Fluids will be new and of the highest quality. We use only genuine Honda automatic transmission fluid (http://accuratecars.com/blog/2009/05/12/use-genuine-honda-fluids-for-best-results-when-servicing-your-honda-and-acura-auto/). We use Castrol motor oil. (http://accuratecars.com/blog/2009/01/22/castrol-motor-oil-selected-for-honda-and-acura-car-customers-of-accurate-automotive-in-nashville-tennessee) If it needs tires, it will have new tires. Our technicians have decades of experience with Hondas and Acuras. They know what to look for and they know how to find it. And they know what to do when it needs attention. In short, you’re not going to drive your vehicle off our lot wondering when you’ll have to bring it back to have something fixed. That used vehicle is fully ready to go when you buy it! And that’s not extra, it’s included in the price you see on our website. Most minivans are used for family activities. Sports practices and games, picnics, vacations, shopping, dropping students off at school and picking them up and all the other things that make up the daily life of your family! 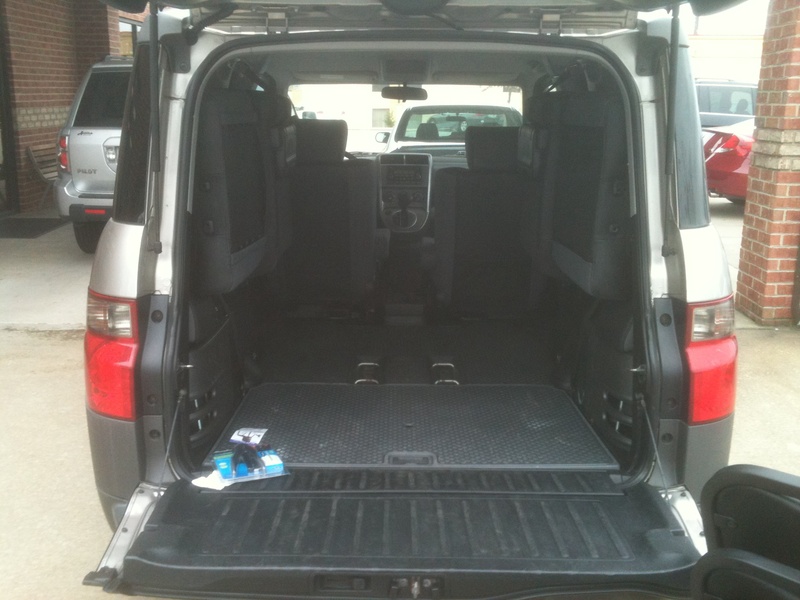 Why spend 2 or 3 times what our minivan would cost for a new or lower mileage one? It’s expensive enough to raise a family, why spend money you don’t have to just to get a vehicle? You’ll still end up with a high quality minivan that’s packed with features, value and the famous Honda and Acura reliability! Remember, it’s the age that counts! And a 2008 is only 3 years old! Even a 2006 is only 5 years old! Finally, on a personal note, the wife of the owner of Accurate Automotive drives a 2003 Honda Pilot with 190,000 miles on it. Recently she and and a group of teenagers from their church were going to St. Louis for a missions project and they needed extra seating and sliding doors. So, instead of the 2003 Honda Pilot, they drove a 2006 Honda Odyssey with 145,000 miles on it. The owner didn’t hesitate to put his own wife and children (along with other people’s children) in the minivan because he knows firsthand the quality and the reliability of the Honda Minivan! He would never dream of asking you to trust a vehicle that he doesn’t trust himself. He puts his money where his mouth is! A Honda Odyssey with “higher” mileage, even over 100,000 miles, might just be your best value in a pre-owned vehicle! 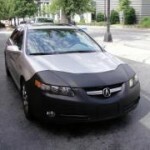 This blog article is a short story on one way to save money when maintaining your Honda and Acura automobiles. There is a well known saying, “if it isn’t broke, don’t fix it”, but this story would apply to another old saying, “pay a little now or a lot more later”. The other day, we had a 2005 Acura TL towed to our facility because the oil light was staying on with the engine running. Fortunately, the driver was very smart…With over a quarter of a million miles on his 2005 Acura TL, he did not want to risk that oil light just being a “false alarm”….So he called for the tow truck and had his vehicle delivered to our service facility. 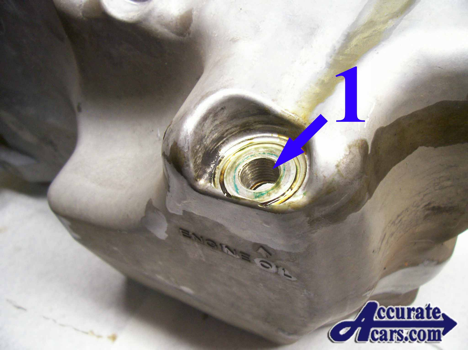 Photo Point #1: For the past several oil changes, the driver had known that the cast aluminum oil pan needed to be replaced because of the worn-out threads, where the drain plug screws in….. After all, his Acura TL has 255,000 miles on it. If changing the oil every 4000 miles; the oil pan plug has been taken out and screwed into the pan over 60 times. On Honda and Acura vehicles, the oil light has one job…. 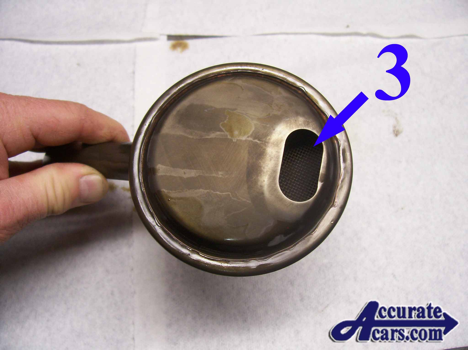 To indicate to the driver when there is not enough oil pressure to properly lubricate the engine and this includes the most vulnerable areas such as where the camshaft rides on the cylinder head cast. Many drivers will see the light illuminated, get out and check the oil level with the dipstick. When they see the level is ok, they think it is a false alarm, but the oil light is to indicate an oil pressure flow problem and does not detect low oil level…. Unless the oil level gets dangerously low so that it effects the oil pressure. THE OIL LIGHT ILLUMINATED ON A HONDA OR ACURA VEHICLE WHILE DRIVING IS RARELY FALSE ALARM AND IF THE OIL LIGHT COMES ON WHILE DRIVING, THE DRIVER SHOULD SHUT THE VEHICLE DOWN IMMEDIATELY AND HAVE IT TOWED TO A REPAIR FACILITY. The oil light was on because the engine could not build oil pressure. 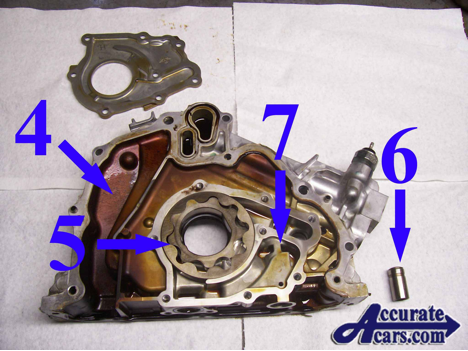 In Honda and Acura vehicles, there is an oil pump that pumps and pressurizes the oil flow, inside the engine (see photo below). Because most of these oil pumps are driven by the engine crankshaft ( photo point 5 ) , the oil pump’s speed and flow rate is influenced by the RPM of the engine. To prevent the oil pressure from being too high when the oil is thick on a cold morning or when the engine RPM is high, such as under heavy acceleration; the manufacturer incorporated an oil pressure relief valve ( photo point 6 ) in the oil pump assembly ( photo point 7 ). As needed, this pressure relief valve opens and “bleeds off” the extra oil flow and pressure, which could damage the engine in specific driving situations and temperatures. So what happened? On this particular morning, the driver had gone out to start and warm-up the engine of his 2005 Acura TL. Noticing that the engine was not building oil pressure (the oil light was staying on), he wisely shut the engine off and called for the tow truck. Some of the worn threads (where the oil pan plug screws into the oil pan) had broken loose and were suspended in the engine oil, inside of the oil pan. 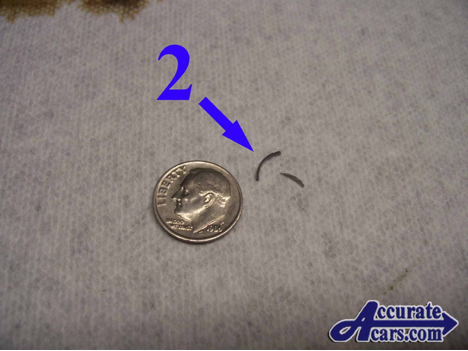 These two thin pieces of aluminum ( photo point 2 ) had actually traveled through the pick-up screen ( photo point 3 ), up into the oil pump assembly and had lodged inside of the oil pressure relief valve bore ( photo point 7 ), which was holding the oil pressure relief valve partially open ( photo point 6 ). At Accurate Automotive, we specialize exclusively in Honda and Acura automobiles. 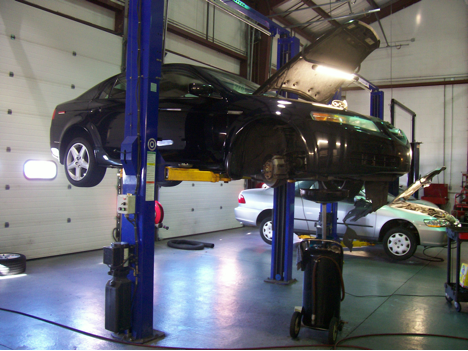 We are diligent in caring for our customers who purchase and service their Honda and Acura vehicles with us, including blog articles, such as this one; which caution our customers of problems that can mutate from small issues to big, hairy problems. An oil pan assembly, with installation on this 2005 Acura TL would have cost approx. $305 plus tax. This particular repair will cost approx. $1200, including the new oil pan…. If the customer had not shut the engine off, a used engine installed in his 2005 Acura TL would have cost approx. $3300. Come in and see why www.accuratecars.com is the best place in Nashville and Middle Tennessee to buy and service your Honda and Acura automobiles.. This www.accuratecars.com blog post is number 6 in a series of used car buying tips, that you can easily perform in conjunction with the internet, when shopping for Honda used cars and Acura used cars. The 1st used car buying tip covered the importance of always referencing the vehicle identification number (commonly referred to as the VIN or serial number),when considering a Honda or Acura pre-owned unit that is advertised online. This is the first step, because without a VIN, a consumer cannot reference a title history report on a particular vehicle. 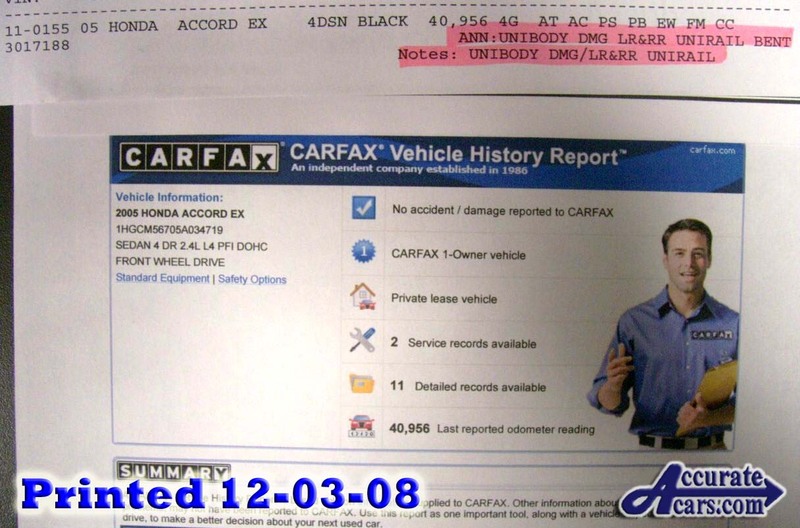 The 2nd Honda & Acura used car buying tip recommended referencing the Carfax Report for possible service history records. Used car buying tip #3 was one of the most important, because it showed how AutoCheck title history reports will expose “frame damaged” and / or “unibody damaged” vehicles that are sold at Manheim Auctions. Used car buying tip #4 covered the importance of referencing both Autocheck and Carfax title history reports because both companies use different referencing sources for their data.This is especially important because one of the sources that autocheck uses is Manheim auto auctions. 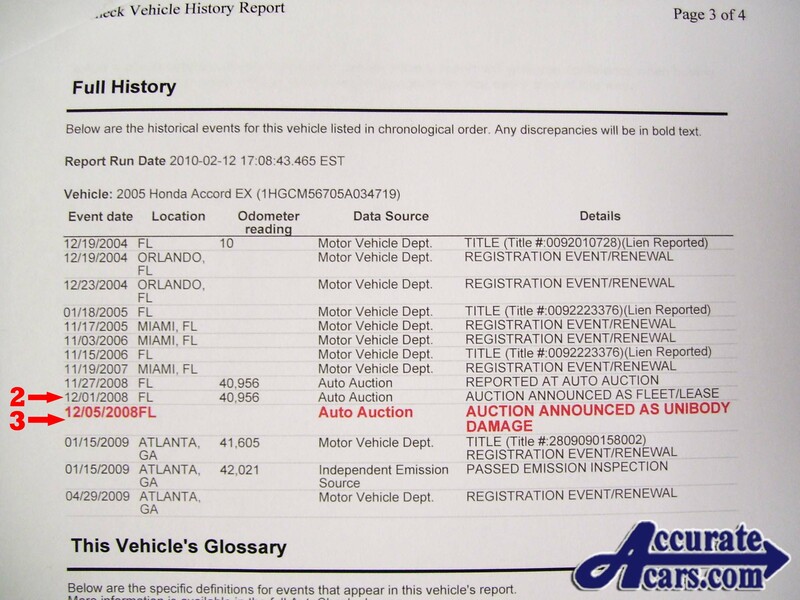 If a vehicle goes through their auction with an announced “frame damaged” condition, autocheck gets notified and they will note it on their title history reports, while Carfax may not get this information. Used car Buying Tip #5 was about the advantages / dis-advantages of buying your next used car from a dealer or a private seller. This article touched on some of the problems that can arise from making a used car purchase from a private seller. Unless you know the person that you are buying that used car from; consumers are more likely and better protected if they purchase their next used car from a licensed and bonded car dealer. Just a few days ago, I was looking at some used car ads online. In particular, I was searching for the very rare 2007 or 2008 Acura TL Type S with a manual 6 speed transmission. Three of them came up in a 500 mile search and all three were “private seller” listings. One of the three of these very rare Acura TL units was posted with a vin in the online ad. The vin that was posted in the ad was 19UUA75507A008231. I went to google.com and researched this vin. Many times, the vin will show “no search results found”, but if their is more information linked to a vehicle identification number, it may show in the search results. Only one link showed in the search results and it was Insurance Auto Auctions in South Carolina. Below are the photos of the 2007 Acura TL Type S that are associated with VIN 19UUA75507A008231. These photos are the property of Insurance Auto Auctions and are only posted in this article for public interest and informational purposes. After our dealership notified Auto Trader dot com of this fraudulent listing that was displayed on their website; they deleted it from their database. Our first Used Car Buying Tip covered the importance of the VIN in an online car ad and this is just one example of how important it is. We did not initially pull a title history report to find out the online ad was fraudulent. We just “googled” the vin. 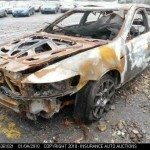 After seeing Google results, we did pull the Carfax Report and the AutoCheck Report and both of them confirmed that this 2007 Acura TL Type S (vin 19UUA75507A008231) was a total loss due to fire damage on April 15, 2010….. Just 5 weeks after being purchased on March 9, 2010. All of the vehicle history was in Greenville, South Carolina…… Which is where the private seller of this vehicle listing was located. 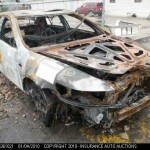 If this vehicle was a total loss due to fire damage in April of 2010, why was it being marketed on auto trader dot com, out of Greenville, SC., in September of 2010? In closing; many would be amazed at the number of online used car ads that are fraudulent in some way. Some simply display photos that do not represent the actual car, while other ads represent units that dealers do not actually have in inventory. Some online used car ads are just scams, where the seller (usually a private seller) has the goal of luring a buyer into making a deposit on a vehicle, that does not actually exist. When shopping for that next used car purchase on the internet, remember that the internet is for infomation and background checking. Search for the used car you are looking for, then use the tools that the internet provides to check the history of the vehicle, then go look at the vehicle and test drive it……. And then make an offer to purchase it. Never place an offer or a deposit to hold a vehicle with an online listing, with a private seller before seeing and test driving the vehicle. Want value, class, luxury, reliability and low maintenance costs in your next used car purchase? Consider the 2007 Acura TL; which is produced by American Honda. At the writing of this article, several 2007 Acura TL units are coming off of 36 month lease, through American Honda, and many of these units are still under the balance of factory warranty. Fuel Efficient: As mentioned in the list above, the 2007 Acura TL comes standard with a 3.2 Liter V6 VTEC engine that produces 258 horsepower. The Acura TL Type S has a 3.5 Liter V6 VTEC engne that produces 286 horsepower. This power-to-weight ratio provides the driver with excellent acceleration as well as great fuel efficiency. Acura TL owners can expect between 30 and 32 MPG on the interstate if they maintain a reasonable and consistent speed of 70 to 75 miles-per-hour (MPH) when using the recommended 91 or higher octane fuel. In stop-and-go city driving, this MPG can drop 20%, which will still provide an average MPG of 23 to 25 miles per gallon. 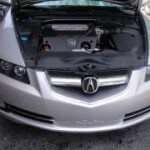 Low Maintenance Cost: As far as maintenance costs, Acura TL owners have very few. In normal driving conditions, American Honda recommends replacement of the timing belt every 7 years or 105,000 miles (whichever occurs first). The manufacturer also recommends that the spark plugs be replaced every 105,000 miles. In most environments, engine air filters and cabin air filters should be replaced every 30,000 miles. As with all Honda and Acura vehicles; our own service department recommends that the automatic transmission fluid be changed once a year or every 15,000 miles, and the engine oil & filter be changed every 3,750 miles. 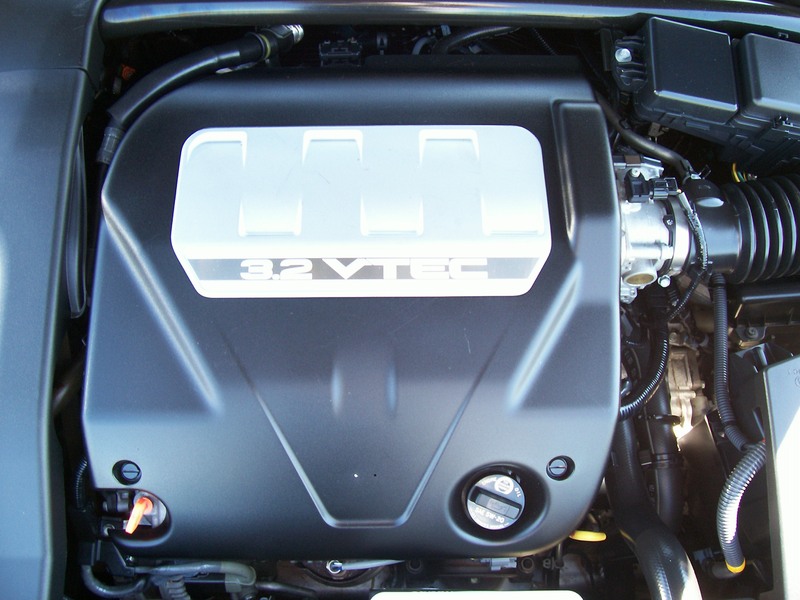 Unlike European vehicles, that may hold up to 10 quarts of a unique oil weight, which may be uncommon to comparable vehicles in the United States; the Acura TL engine holds approx. 4.5 quarts of 5w20 motor oil and a $6.00 spin-on oil filter. Market Driven Oppportunity: As with most vehicles that have an initial MSRP of over $32,000; a large percentage of Acura vehicles are leased for the first 3 years. Once the 36 month lease term has ended; many of the Acura cars and SUV units are then sold by American Honda Finance at dealer auction. To the consumer, this is an opportunity because of the large volume of lease units that saturate the market for a few months. Currently, there are enough 2007 Acura TL units in the market, that a dealer can likely sell a 2007 model for less than a 2006 model Acura TL. However, this market condition will not last. Within just a few months, this surplus of 2007 Acura TL units will be absorbed into the retail market, and dealers will then be paying more for the same vehicle when obtaining them from American Honda. One Final Thought: For the readers that sit on the fence and say, “the same thing will happen when the 2008 Acura TL units come off lease”……. My response is, “don’t count on it”. In 2008 we were paying very high prices for gasoline and we also had a presidential election. This effected leases and purchases in 2008. In 2009 we had two major car manufacturers go dormant in the U.S., for about 8 months and we also had the program, “cash for clunkers”. This effected new car inventory and used car inventory. In 2010, we have had major flooding in several areas of the United States. This has destroyed many vehicles that were flooded and the replacement of these flooded vehicles has also weighed heavily on new and used car inventories. This www.accuratecars.com blog post is number 5 in a series of used car buying tips, that you can easily perform in conjunction with the internet, when shopping for Honda used cars and Acura used cars. There are many used car buyers that refuse to go through a car dealer for their used car purchases and based on their past experiences; their objection may be understandable. All types of businesses have competitors that are dishonest and may not serve the public well. There are restaurants that serve bad food. There are grocery stores that charge excessive amounts or may sell food that is past it’s “sell by” date. There are dishonest attorneys. There are banks that consumers would not open an account with or aquire a home mortgage through. And, there are many car dealers that have been known to be dishonest, charge excessive amounts, and not provide a good product……. But there are also good car dealers that are out to help consumers obtain a good deal on a used car and many of these same dealers won’t rope a car buyer into products (including extending warranties) that will have little or no benefit to the consumer..
First, car dealers must be bonded and licensed. This means that car dealers are held to a professional standard that ensures compliance with Federal laws, State laws, and local ordinances. These professional standards can include selling a car that has a reasonable history, satisfying any and all past financial leins associated with the vehicle, collecting and paying all applicable taxes that are associated with the sell of the vehicle and making sure that the ownership of the used car can be transferred with ease. If a dealer sells a vehicle that does not have a clear title or does not meet certain criteria; the bond that he must carry will monetarily guarantee that he will fulfill his legal obligations in all car transactions. If he doesn’t fulfill his legal obligations; his bond company will financially compensate the buyer. In most cases, a car buyer does not have this level of security, if purchasing a used car from a private individual. Second, most used car dealers have an business investment to protect. Ever heard the phrase “good news travels fast, but bad news travels faster”? This is true in all businesses and especially true in the car business. What the dealership looks like and how long has it has been in business can greatly effect your used car buying experience. A used car dealer that has been in existence for several years and has built a reputation of being an honest and legitimate business will not likely be willing to sell a vehicle that can have repercussions that can damage his reputation. An internet car dealer that has not been in business very long and simply operates out of his house or out of a warehouse; has very little to lose. If his reputation starts to effect the number of cars he can sell on the internet, in a month; he can simply move his warehouse operation and change the name of his business. A private seller also has little to lose if he takes advantage of an internet car buyer. Third, car dealers can usually save you money on a used car purchase and the newer the vehicle, the more this holds true. Used car dealers are in the business of buying and selling cars and in most cases that involve late model, low mileage vehicles; they can save the consumer several thousand dollars off of new car prices. While good ole American car marketing attempts to make the idea of purchasing a new car as the safer and better investment, new car depreciation will bring all new cars down to a resale level that is very close to the same vehicle that is one or two years older. Because of new car depreciation, a private individual is rarely in a position to sell the same one or two year old vehicle at a better price or that is in better condition. At www.accuratecars.comwe are focused on all aspects of Honda and Acura car ownership. This includes buying, servicing, and repairing. Whether you live in the areas around Nashville or outside the State of Tennessee; we are in the business to help consumers with their Honda and Acura cars. Thanks for reading our blog articles. The rains that came to Middle Tennessee this past weekend were monumental and resulted in major property damage in many areas around Nashville. Because of this; consumers considering the purchase of both used cars and new cars need to be sure that their target vehicles were safe and unscathed during this time. At Accurate, we have always respected the weather and this especially holds true during the Spring-time. We constantly monitor our local weather and when strong storms, high winds, and hail are predicted or possible; we move our Honda and Acura used cars inside of our service facility. This past weekend, the weather prediction was for heavy rains. 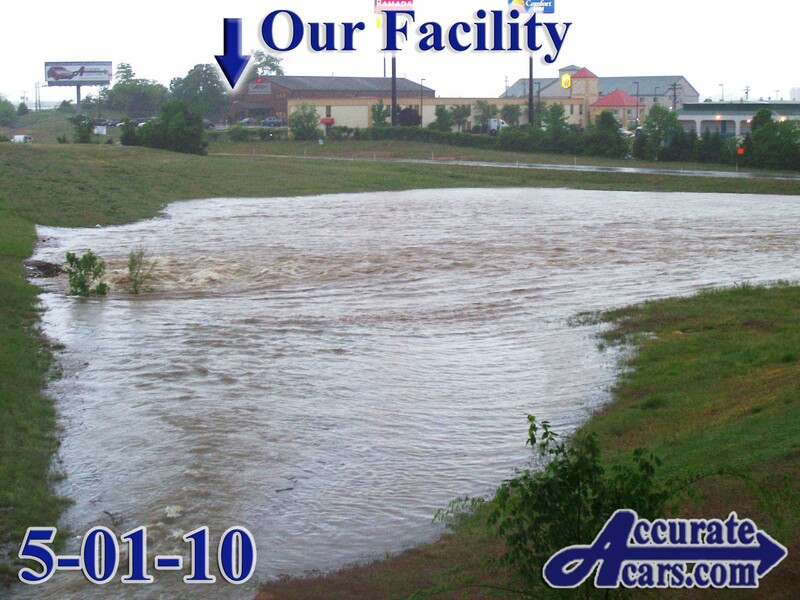 Because Accurate was built on a high elevation off of the interstate, flooding is not an issue. The photo below shows a storm drain and some of the impact that the flood waters had on our local area. This photo was taken after the heavy rains on Saturday afternoon and this is the highest that the waters came in the immediate area. In the background, you can see that our facility is on a significantly higher elevation and completely safe during this historic rainfall event. The second photo was taken on the following Monday morning and is at the same location; to give indication of the topography (varying elevations) of the area. The silver lining: Middle TN has always been noted for having high pollen counts during the Spring….. Right now, even the most asthmatic can breathe easy. This www.accuratecars.com blog post is the fourth in a series of used car buying tips, that you can easily perform in conjunction with the internet, when shopping for Honda used cars and Acura used cars. On the Used Car Buying Tip #3 article, we were a little tough on Carfax. After reading that article, some readers may have concluded that Carfax deserved it, because not only did their report not show that a “frame damaged” vehicle had gone through an dealer auto auction, but it didn’t even show that the vehicle had been involved in an accident…..But don’t choose one title history report over the other….. Remember, title history reports are simply data entries that make a historical record of a vehicle. The sources that AutoCheck uses may vary to some of the sources that Carfax uses……..So both title history reports should be pulled and examined before making your used car purchase. 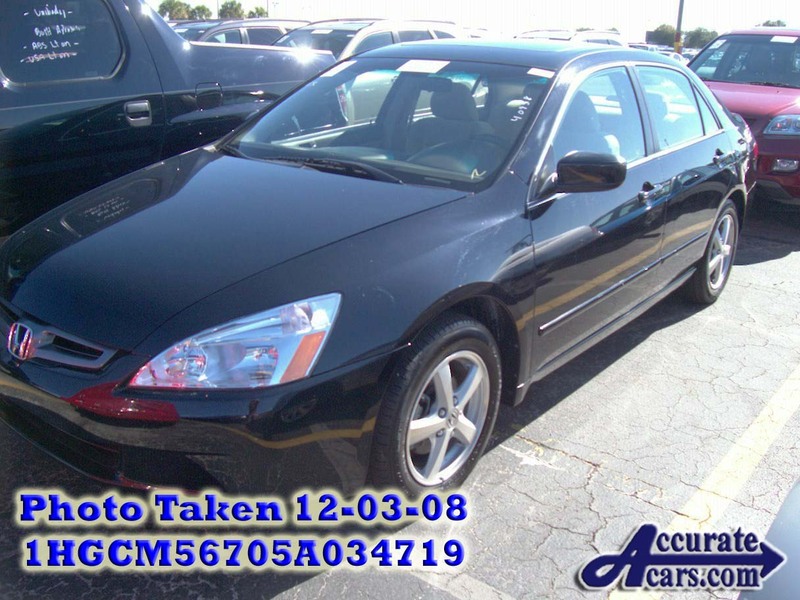 In this article, we are going to make a timeline of events referencing the same vehicle from our used car buying tip #3 article; the 2005 Honda Accord EX, vin 1HGCM56705A034719 (pictured above with a copy of the clean Carfax Report printed on 12-03-08). We will also be referencing a present day copy of both the Carfax Title History Report and the AutoCheck Title History Report (pictured below). 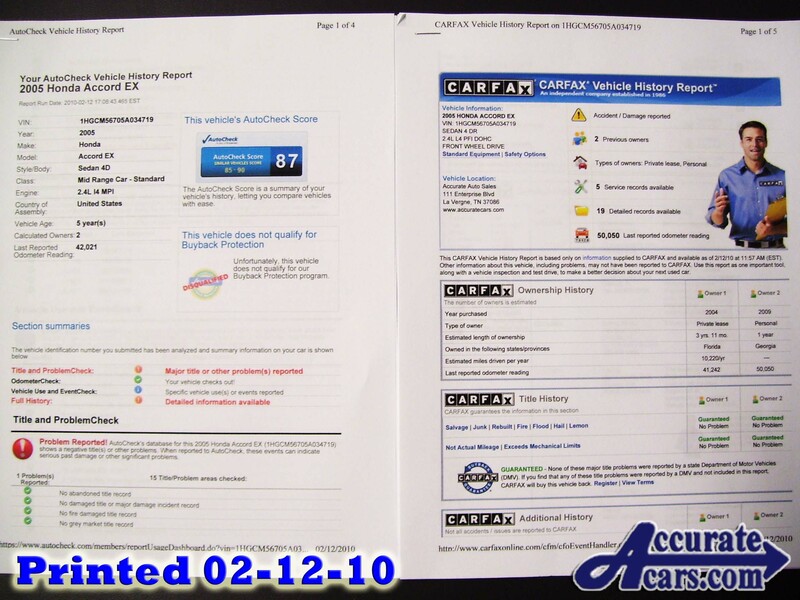 The AutoCheck and Carfax reports that are pictured below were pulled and printed on February 12, 2010. #1 Carfax shows this vehicle was sold at dealer auction on December 1, 2008. 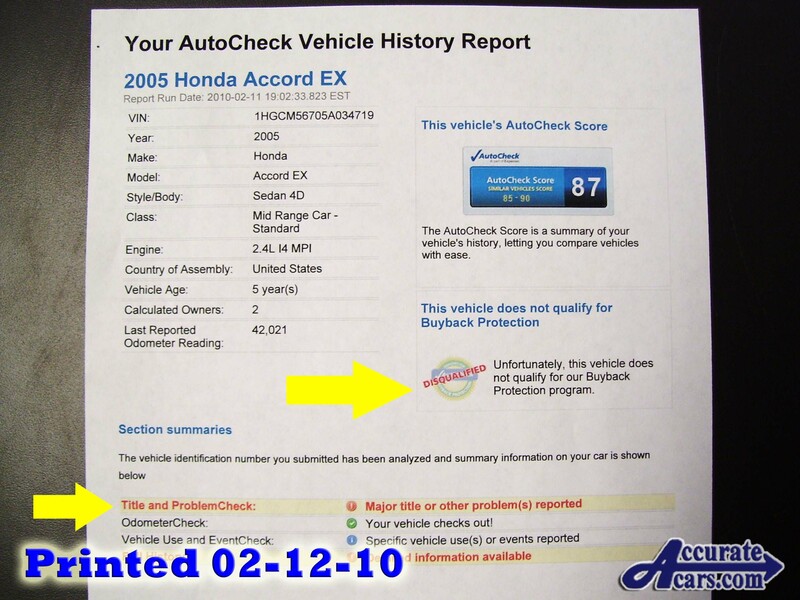 #2 AutoCheck shows vehicle is announced as fleet lease on December 1, 2008. To this point, AutoCheck is the most accurate record. 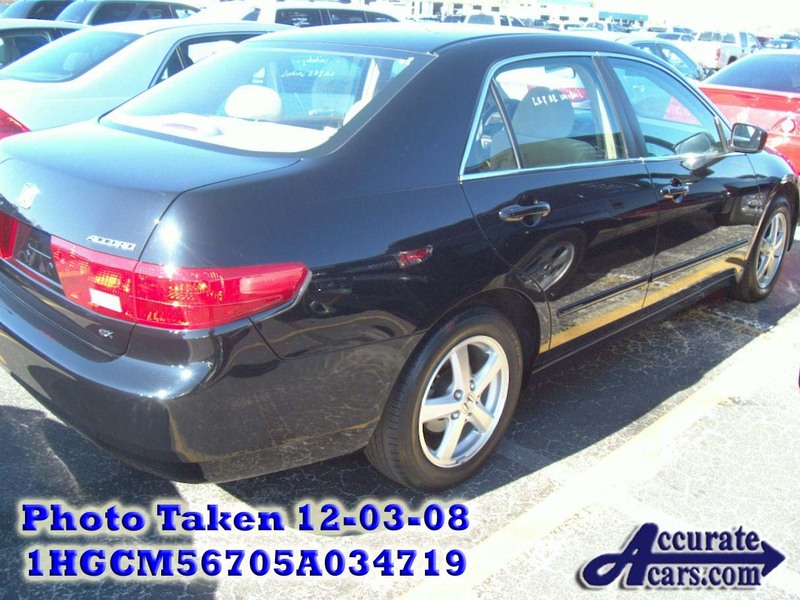 This 2005 Honda Accord was actually sold at dealer auction on December 3, 2008. 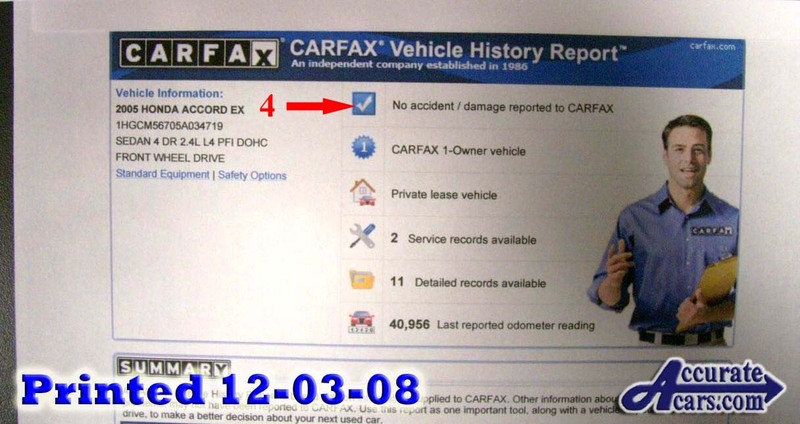 #4 The Carfax Report (printed on December 3, 2008) shows no previous accident damage. #6 , #7 and #8 are critical problems with Carfax. The reason is because until October 15, 2010 this “frame damaged” Honda Accord had a clean Carfax Report with no accident data. This means that the present owner of this vehicle had owned this 2005 Honda Accord for almost a year before accident data showed up on the Carfax Report from July of 2008. This 2005 “frame damaged” Honda Accord had a clean Carfax Report when the current owner purchased it on December 18, 2008. 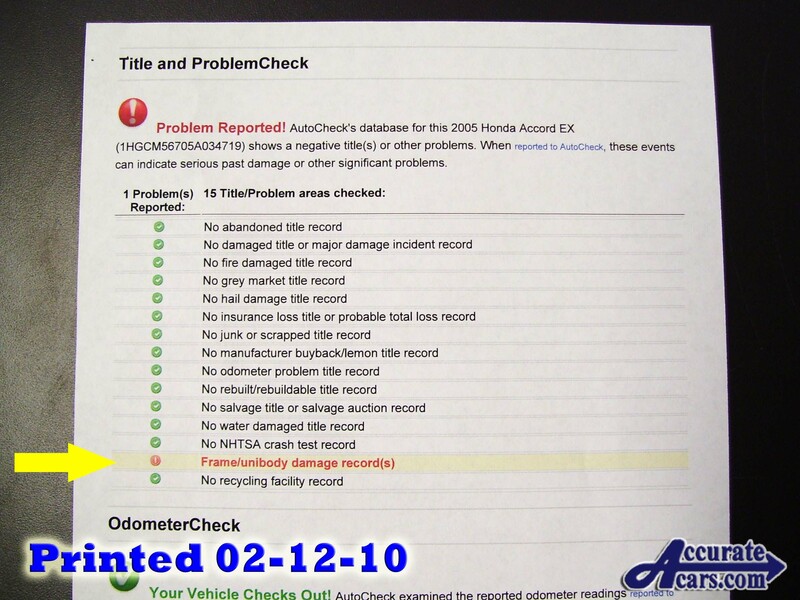 To date, with the exception of the “announced condition” at dealer auction, AutoCheck still does not show the vehicle accident on July 8, 2008. This is the reason that both Carfax and AutoCheck should be viewed before purchasing your next used car. These title history reporting companies use different sources for their data and one title history report may differ from the other. The website www.accuratecars.com consists of Accurate Automotive and Accurate Auto Sales. 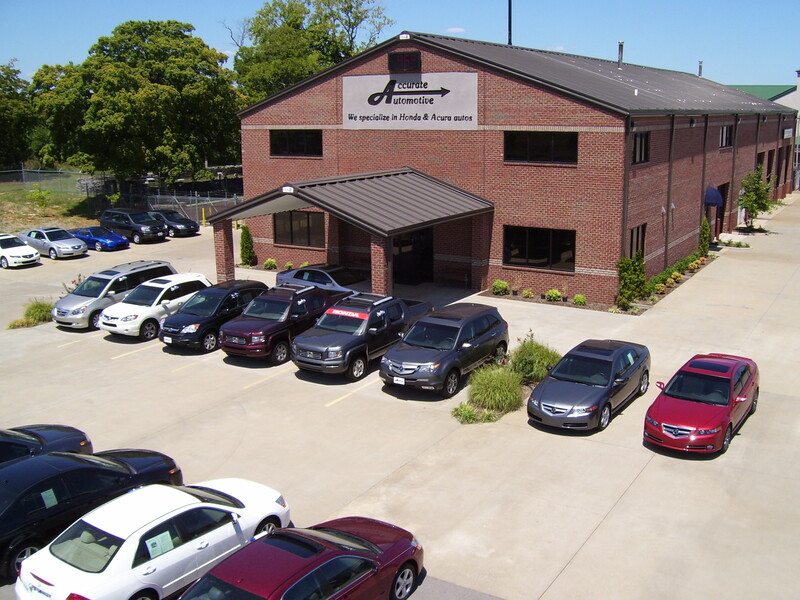 Both Tennessee based corporations are independent, non-franchised companies that exclusively specialize in the sales & service of Honda and Acura automobiles, vans, and SUVs, in the Nashville / Middle Tennessee area. Both companies are privately owned by the same individuals and are not endorsed, or paid by any outside sources. Accurate Automotive and Accurate Auto Sales are not affiliated with American Honda, Acura, Carfax, AutoCheck, or Manheim Auto Auctions. The companies listed above were named in this article for informational purposes only. Whether they are at our facility in Nashville, TN or across the country, in another state; at Accurate, we want all consumers of Honda & Acura products to be treated honestly in sales & service. For this reason, we are writing these used car buying tips along with other blog articles for tips on service & maintenance of Honda and Acura automobiles. This www.accuratecars.com blog post is the third in a series of used car buying tips, that you can easily perform in conjunction with the internet, when shopping for Honda used cars and Acura used cars. This next tip has reference and photos from an earlier blog article that we published on the website in 2008. The direct link to that article is posted below. Tip #2 recommended referencing the Carfax Report for possible service history records. While all of our used car buying tips are helpful, this next tip on buying Honda used cars and Acura used cars is one of the most important. Many car buyers and internet car shoppers are familiar with Carfax Title History Reports. Carfax has spent a fortune in branding their name and because of their marketing investment, Carfax is currently the most recognized title history reporting source. However, there is another title history reporting company called AutoCheck, and it is owned by Experian. 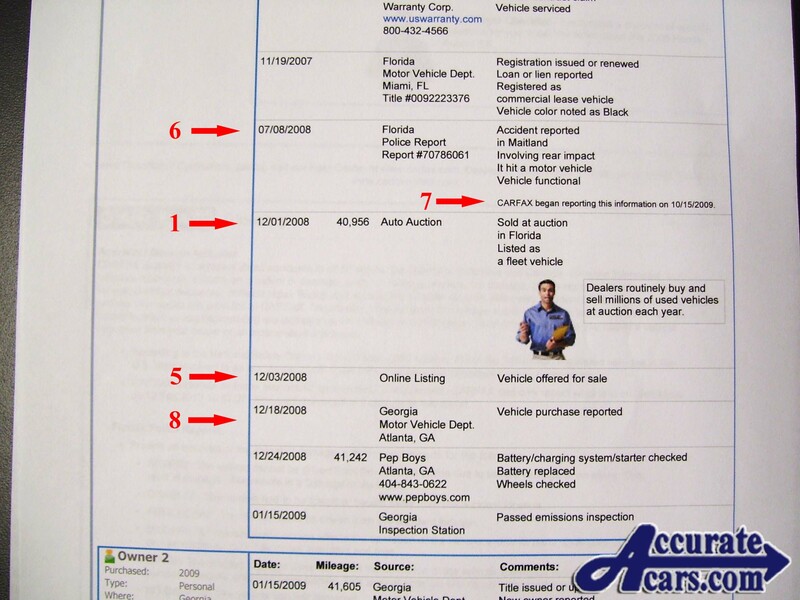 AutoCheck has also been around for several years, but AutoCheck has not marketed itself as agressively as Carfax. 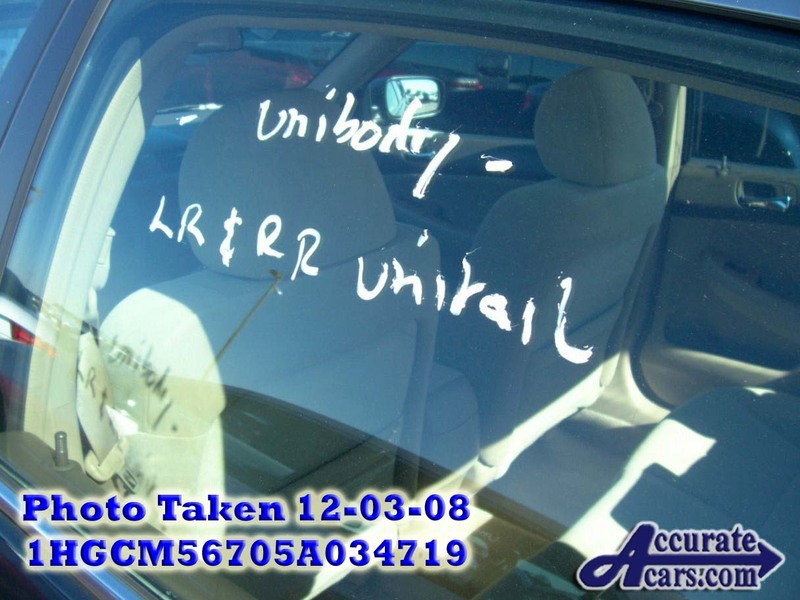 The most important thing about AutoCheck title history reports is that Manheim Auto Auctions report directly to AutoCheck if a vehicle is sold at any Manheim auction facility as a “frame damaged” or “unibody damaged” unit. While only a small percentage of vehicles sold at Manheim Auctions are frame damaged units, many of these vehicles that are announced as “frame damaged” or “unibody damaged”, have a clean Carfax Title History Report. Just a few years ago, there were some unscrupulous car dealers that were buying “frame damaged” used cars at dealer auction, and at a huge savings because of the announced “frame damage” or “unibody damage” condition. These dishonest dealers were then marketing and selling these units on the internet, on sites such as Ebay, and without full disclosure of the “frame damage” condition. This was a big problem with Ebay because many of these vehicles had a clean Carfax History Report. For this reason, Ebay Motors started posting the AutoCheck Report on all of the cars listed on Ebay’s site. Today, if a vehicle is posted on Ebay, the AutoCheck report is automatically posted on the listing as well. 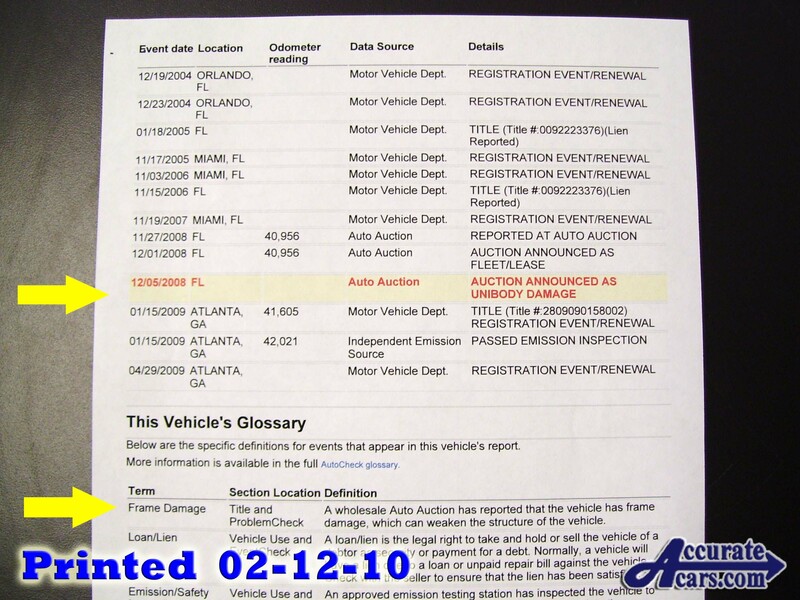 Carfax simply does not receive this information from Manheim Auctions….But AutoCheck does. The website www.accuratecars.com consists of Accurate Automotive and Accurate Auto Sales. Both Tennessee based corporations are independent, non-franchised companies that exclusively specialize in the sales & service of Honda and Acura automobiles, vans, and SUVs, in the Nashville / middle Tennessee area. Both companies are privately owned by the same individuals and are not endorsed, or paid by any outside sources. Accurate Automotive and Accurate Auto Sales are not affiliated with American Honda, Acura, Carfax, AutoCheck, Manheim Auto Auctions, or Ebay Motors. The companies listed above were named in this article for informational purposes only.